There’s no way to talk about Walk The Moon without mentioning Shut Up And Dance. For as slight as its qualifications as a rock song are, it was still a significant rock crossover in 2015 when that was virtually unheard of, not to mention the sort of upbeat, bright pop song that so much of the dour 2015 charts lacked. Even if the album it was from Talking Is Hard didn’t reach similar levels of smash success, the fact that Walk The Moon had a genuine hit under their belts wasn’t something to be overlooked. As such, it was always going to be interesting to see what a post-Shut Up And Dance Walk The Moon would deliver, and how influential their flirts with mainstream superstardom would be. Well, if anyone’s expecting Walk The Moon’s dalliances with the pop world to translate to What If Nothing being a similarly succinct, straightforward indie-pop follow-up, they wouldn’t be blamed but they’d be proved demonstrably wrong. If anything, What If Nothing sees its creators venturing into the wilderness and coming out with a lumpen, misshapen mess of an album that may cultivate some gems in isolation, but is the furthest thing from a concise body of work. More power to them in that regard – both in Nicholas Petricca’s delivery and lyrics, there’s a sense of liberation and freedom that can be infectious – but What If Nothing can’t reasonably keep it up for nearly an hour, and falls flat too often to fully make the most of what they’re trying to do. It’s not even difficult to figure out why either – Walk The Moon’s best always comes from big, brash populism (see Shut Up And Dance), and What If Nothing seems to want to be a more complex, varied album in a manner that feels out of the band’s depth. Those moments do show up in some measure here, though; lead single One Foot is probably the most obvious example with its rubbery guitar line and a chorus that’s practically begging to be slotted into radio playlists, but there’s also the bubbling ’80s synths of Tiger Teeth that recall The Killers’ more stripped-back moments, and the remarkable stride hit towards the end with the sharp, antsy bass of Feels Good To Be High and makes way for a number of cuts that draw heavily from the razor-edged indie-pop of The 1975, and do it rather well at that. But those are just moments, and while they serve as the vehicles to portray Walk The Moon positively, What If Nothing has an equal amount that, to put it simply, don’t. Making blocky, clanking beats the engine room of almost the entire album doesn’t particularly instill any votes of confidence, but neither does the twin-headed flop of Press Restart‘s inelegant mashup of about three different songs and the clumsy, fuzzed-out Headphones which act as the album’s introduction. Even worse still is the six-plus-minute-long Sound Of Awakening, which blatantly pulls from U2-standard naval-gazing in what appears to be an AutoTune-drenched rendition of Phil Collins’ In The Air Tonight which, if quality control was promoted above an afterthought, would not have been here. That’s probably what does What If Nothing the most disservice, in that Walk The Moon seem hell-bent on overcomplicating an album that doesn’t need it in the slightest. This is an album about freedom and making it to the light at the end of the tunnel unscathed, but just like Imagine Dragons on Evolve, Walk The Moon weigh down such a simple concept with superfluous pretensions to depth and grandeur. Petricca is nowhere near as robotic as Dan Reynolds can be and the songwriting and instrumentation is a least a bit more nimble (it’s why the blatant stab at arena-level power-balladry on Surrender does end up working), but for the straightforward intent that Walk The Moon have, What If Nothing can be so flabby and unresponsive that there are multiple points where it’s so easy to zone out and leave the intended effect as nonexistent. Overall, it feels like Walk The Moon aren’t playing to their strengths with this album, or even anything that could even remotely be deemed a positive at points. For as much as the kernel of a solid, workable idea shines through, What If Nothing is padded out with too much extra weight to highlight its best moments in a positive light, and not just pleasant breaks from an album that feels mundane and ultimately boring to listen to. It’s not difficult so see why Walk The Moon are often considered a singles act, but when they reinforce that idea with albums like this, that doesn’t help when it comes to shedding it away. 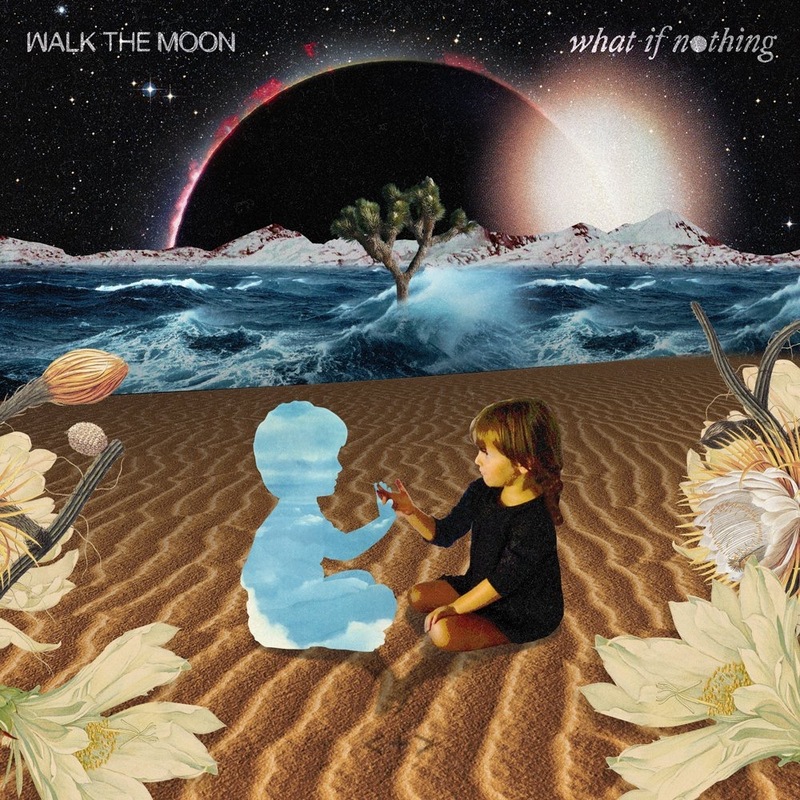 ‘What If Nothing’ by Walk The Moon is out now on RCA Recordings.